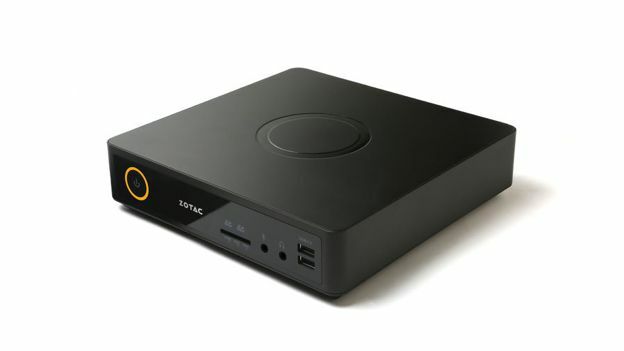 Zotac has a new small form factor PC up its sleeve that packs a punch in the graphics department. The Windows 10-ready Zotac Magnus EN970 uses a 5th-generation Intel Core (Broadwell) CPU and more impressive is the desktop-level Nvidia GeForce GTX 960 GPU that helps it show that big things come in small packages. It really is all about power with the Zotac Magnus. The Intel Core i5-5200U CPU is clocked at 2.2GHz (turbo boost to 2.7GHz) and the Nvidia GPU makes its way into the box thanks to the low power requirement that it has. The range is made up of two separate PCs. One is the base model whereas the Magnus EN970 Plus comes with 8GB of DDR3L RAM and a 120GB M.2 SSD. For beginners the Plus is an attractive option whereas anyone looking to tinker with the base model gets enough slots to play around with. Input-wise, there are four HDMI 2.0 ports, four USB 3.0 and two USB 2.0 slots and a three-in-one card reader plus dual ethernet, 800.11ac Wi-Fi and Bluetooth 4.0. All that inside a box that measures at just 210 x 203 x 52.5mm. Thanks to the Nvidia GeForce GTX 960 and HDMI 2.0 port it should be able to push out 4K content at 60fps and opens up real opportunities for it to be used as a media streaming box at the centre of the home. Why is Intel's NUC the ultimate PC for the connected home?